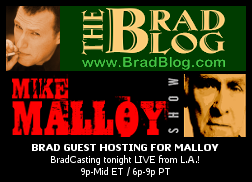 Expect another busy night tonight, as my week guest hosting for the "Spring Breaking" Malloys continues on the nationally syndicated Mike Malloy Show tonight. JOHN NICHOLS of The Nation, LIVE from Madison, WI on the nationalized, bellwether Supreme Court election being held there today, which is being regarded as a proxy battle between the GOP/Gov. Scott Walker and the unions, the people and everybody else. HOWIE KLEIN of Down With Tyranny, on what today's election may portend for the rest of the nation and for the 2012 elections, and on the continuing "budget showdown" in D.C.
TIM DECHRISTOPHER, Utah climate activist and national hero, on his remarkable attempt to disrupt an auction of 100,000 acres of federal land for oil and gas drilling during the Bush Administration, in hopes of keeping them out of corporate hands. And on his subsequent felony convictions for that act of civil disobedience, which he now intends to appeal. « PREVIOUS STORY "Our Brief Audio Tribute to Martin Luther King, Jr. on the 43rd Anniversary of His Assassination"
Listening to John Nichols ... glad he is realistic, and thinks the unthinkable could happen i.e. Prosser gets defeated ... that is optimistic ... I hope Nichols is correct. (the election was expected to be a no-contest for a Prosser win) ... but it is neck and neck. Brad says do not concede until all ballots are counted! Watch out for dirty tricks in the Wisconsin recount. But even with 97% of the vote counted, less than 2,000 votes separated the candidates. That close margin had political insiders from both sides talking about the possibility of a recount, which Wisconsin has avoided in statewide races in recent decades. Any recount could be followed by lawsuits - litigation that potentially would be decided by the high court. If it goes to recount, then litigation, eventually ending in the Supreme Court of Wisconsin, lets hope Prosser recuses himself. If so, and an even tie results in the final vote there, then the lower court ruling will stand, whatever that lower court ruling is. A system that handles close races with exactitude is preferable, but probably out of reach in today's culture. Can any Dane County or Madison citizens out there report the election results from the referenda on corporate personhood and money as speech on the April 5 ballot? Haven't seen any reports on the results. Did see a report that election turnout was up, but not as far as I'd expect --- in the 30+ per cent overall, with some heavy Dem areas as high as 70 percent turnout. If you can only get 30 per cent overall statewide turnout with the kind of stuff we have seen going down in Wisconsin, it's hard not to conclude that we really are an apathetic nation, or a discouraged one ("voting doesn't change anything"). I wonder if locals think the reported turnout matches up with their experience at the polls? Turnout shattered predictions. State officials had expected 20 percent in line with past elections, but Democrats' efforts to make the election more about Walker and the union fight than the officially nonpartisan Supreme Court race helped push it to 33 percent. In another race that became largely about Walker and his policies, Democrat Chris Abele defeated Republican state Rep. Jeff Stone to become Milwaukee County executive, the seat Walker held until he was elected governor in November. Stone voted twice for Walker's bill taking away nearly all of most state workers' collective bargaining rights from, which put him on the defensive in the race. Abele won with 61 percent of the vote compared with 39 percent for Stone, based on unofficial results. How can Stone be beaten so bad and the other, more important race be so close? Shouldn't Kloppenburg's lead be similar?